The concept of wage setting i.e., the compulsory wage structure imposed on employers by the State has been evolved in the global economic system to protect the poor workers from exploitation and deprivation. The minimum wage is an attractive policy tool for poverty reduction and social justice. It is a simple and visible way for the government to show its commitment to support those at the bottom of the income distribution, requiring no significant direct government expenditures and can easily be targeted to the working poor. Minimum wage is a crucial tool in South Asian countries as well to show its efforts to end poverty by countering the declining earnings of low- wage, low-skilled workers and low-income families and by offsetting living costs (food, housing, health, education) that have become increasingly out of reach for low income families. Countries in the region have introduced minimum wage regulations for the protection of workers, particularly for the disadvantaged group of wage earners. Indeed, wages and work standards have been regulated in all of the South Asian countries, however the level of these standards and the strength of implementation differ considerably. In South Asia, Bangladesh, India, Pakistan and Nepal follow certain criteria in determining the minimum rates of wages. Sri Lanka has no statutory criteria for setting the minimum wage. The basis to minimum wages reveals that across five countries the cost of living serves as the common foundation for determining the minimum wage. However, certain criteria vary over time and across countries. This is because each of them is linked to different objectives. 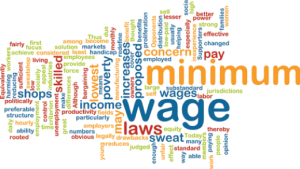 In some countries the minimum wage may be perceived as a way of ensuring a decent standard of living, in which case the purchasing power criterion will take precedence over other considerations (Bangladesh, India). In others, the fight against inflation may well be a priority - or might become a priority (India, Nepal, Pakistan, and Sri Lanka). Here, the inflation rate is the main criterion retained. Often the contradiction is between (a) social needs; (b) ability to pay; and (c) macroeconomic issues. The need for balancing becomes important. The minimum wage regulation systems of the countries mentioned above have a factor in common - narrow coverage. All countries set minimum wages by sector. The two exceptions are India and Pakistan, which has also national, regional and occupational minimum wages. In Bangladesh, India and Pakistan the number of sectors subject to minimum wage regulation is significantly large but, even so, just a small proportion of the non-agricultural labour force is covered in each country. Along with it differs in other important respects, such as frequency of adjustments and the form of decision-making. Trade unions across South Asia thus need to come forward with programmes to implement uniform living wage in the factories. The programme could include bargaining with the government and the employers to revise the existing wage structure immediately. They can also launch programmes to popularize the issue of living wage for workers with necessary arguments, information and instances in the prevailing context of South Asia. The trade unions should continue guiding the workers to understand labour laws, labour rights and responsibilities of the workers in establishing good industrial relations in the factories. The organizations should continue bargain with the government to initiate welfare and social protection programmes for the workers as well as call for forming national minimum wage boards to ensure decent wage for workers. They need to continue advocating and act as pressure group with major political parties of the country so that the political parties recognize the workers as legitimate constituency and their concerns and legitimate demands such as right to decent living is taken care of. Furthermore, the workers’ organizations need to enhance their capacity to articulate arguments in favour of decent wage and enhance their negotiating capabilities by coming up with a strong united voice and full and effective representation of workers in all future bipartite/tripartite negotiations so that workers win an equitable outcome – the living wage for a decent living. Without setting and agreeing to a common set of indicators for ensuring workers’ decent living across South Asia, it would be hardly possible for the workers and their representatives to articulate their legitimate demands through institutionalized routes for channeling their grievances, and at the same time, win equitable outcome from bargains.